Mülheim, November 7, 2018 – At the SPS IPC Drives fair, Turck will be presenting the first device in its Q300 UHF reader family with an Ethernet interface. 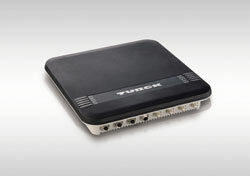 RFID users particularly benefit from the range of platforms and interfaces of the Q300 readers. Up to four external antennas can be connected directly on the reader, thus considerably simplifying the creation of high performance gate applications in multiplex operation. The direct connection of triggers and signals via universal I/Os also simplifies the installation. With an output power of up to 2 W the readers can achieve very large read/write ranges. Their selectable antenna polarization enables read holes to be excluded in any environment, even with a high output. With the Q300 series Turck is strengthening its position as a system supplier for these key Industry 4.0 technologies.